By Stas Bekman and Jim Brandt. Published by OnyxNeon in August 2007. 50% of this book's proceeds will go to The Perl Foundation. You can purchase it from amazon.com, powells.com. If you aren't familiar with mod_perl, it's a combination of Perl and Apache. Apache is the most popular free and open source webserver that delivers most of the pages on Internet. Perl is a very popular programming language, that used to be the language of choice for web-programming (though now many other languages are widely used, some more popular than the others). And finally mod_perl allows programmers to develop the software in Perl and take advantage of a very rich API that Apache provides (and which is not available through the CGI interface). For more information see: http://perl.apache.org/. mod_perl 2, the next generation of the Apache Perl module, gives you full access to the Apache 2 internals via the Perl programming language, just as mod_perl 1 gave you access to Apache 1. New features in Apache and Perl make mod_perl 2 even more powerful and useful than before, allowing you to quickly write and deploy fast, robust web applications. Multi-Processing Model modules (MPMs) allow for process-based and thread-based processing models. The addition of thread support makes mod_perl viable on Win32 and introduces the potential for improved performance on other platforms. Protocol Modules give Apache and mod_perl the potential to serve any protocol, not just HTTP. A mod_perl 2 interface to the Apache filtering API gives full access to input and output filters from Perl. Support for creating custom Apache configuration directives in pure Perl, improved options for passing values to Perl modules from Apache, and greater access to the Apache configuration values. The Apache::Test testing framework, useful for Perl and non-Perl Apache modules, allows you to develop fully-tested web applications to verify features and guard against regression. The ability to easily subclass ModPerl::Registry and override methods as needed. This guide provides installation and configuration guidelines, as well as descriptions of all of the ways you can plug into the Apache request cycle. You'll also learn how to write mod_perl handlers to deliver content with rapid response times and to leverage your existing CGI scripts with ModPerl::Registry. 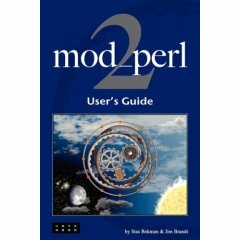 Whether you're new to mod_perl or migrating from mod_perl 1, the mod_perl 2 User's Guide will give you the information you need to get up and running on Apache 2 and mod_perl 2. An interview with Jim Brandt by Andy Lester. Check out the Practical mod_perl book, by Stas Bekman and Eric Cholet. Full content of the book is available online. update: unfortunately the original domain used to host that book: modperlbook.org wasn't renewed and now is used by a spammer. The contents of that site can now be found here. Stas also created a site where you can read free online books. You of course are familiar with his oldest site is stason.org.